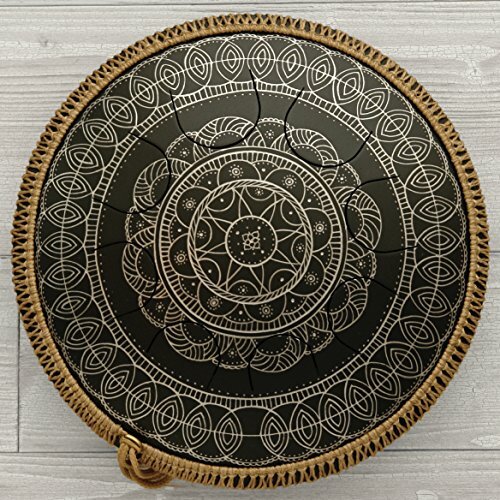 GUDA DRUM Freezbee – unique idiophone, steel tongue drum, which collects many of handpan characters. Can be played easily with fingers or mallets. GUDA Freezbee is compact model which costs as tank drum but has the traditional GUDA quality. It is made from stainless steel and manually decorated. GUDA DRUM Freezbee has percussive sound with some wooden overtones. It is 14.7″, weighs only 4 pound and is very slim.Ideal for outdoor gig. It is excellent sounds with other melodical instruments and percussion (including senior GUDA models).